Simulated human is the upper body of a male adult. There is built-in lithium battery, which could be used for outdoor training. External attachment could be connected with simulated human via wireless mode. External attachment could be tablet computer or computer. Scan QR code or Input the address in browser to connect simulated human, there is no need to install any apps in external equipment. During training mode, system will automatically score in according to the operator’s behavior. During examination mode, teachers comment and score for each operation procedure. It is available to set up the grading parameter, add or delete operation steps, adjust operation orders and set up value of each step, result export. System could detect angle of head-back position, application status of laryngoscope, inserting depth of trachea cannula, ventilatory capacity and ventilation interval. 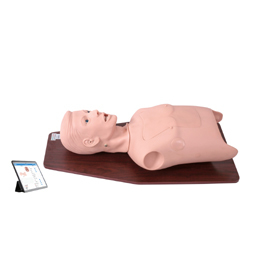 It is also available to synchronously show dynamics of tracheal insertion, insertion position and ventilation curves of student. It is able to review the whole operation procedure of trachea cannula via operation log, learning about the mistakes made that students made from the operation result. System supports training and examination of common errors during trachea cannula: if operation procedure is wrong, poor preparation of apparatus, wrong angle of head-up, inserting too deep of trachea, trachea inserts into bronchus, trachea inserts into esophagus; teeth are overstressed during intubation; laryngoscope is used for a long time; ventilation capacity, wrong ventilation interval, operation duration is too long; humanistic care is not qualified. If trachea cannula position is correct, it is available to observe chest rise and falls of simulated human during ventilation. Intubation position could be judged via stethoscope. If trachea cannula inserts into bronchus, unilateral chest rise and falls could be seen during ventilation.